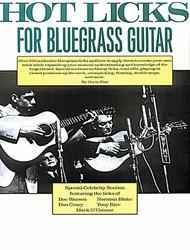 Over 350 authentic bluegrass licks and how to apply them to create your own solos while expanding your musical understanding and knowledge of the fingerboard. Special sections on bluesy licks, trail-offs, playing in closed positions up the neck, crosspicking, floating, double stops, and more. Special celebrity section featuring the licks of Doc Watson, Norman Blake, Dan Crary, Tony Rice and Mark O'Connor Over 350 authentic bluegrass licks and how to apply them to create your own solos while expanding your musical understanding and knowledge of the fingerboard. Special sections on bluesy licks, trail-offs, playing in closed positions up the neck, crosspicking, floating, double stops, and more. Special celebrity section featuring the licks of Doc Watson, Norman Blake, Dan Crary, Tony Rice and Mark O'Connor.